Depression is not uncommon in middle-aged women, not least because of its connection with menopause, and it can have unfortunate consequences on various aspects of life. Many middle-aged women find that the development of depression brings with it uncomfortable physical and psychological symptoms that mean relationships, work life, and social activities are negatively affected. Understanding the causes and symptoms is often the first step to recovery. Read on to discover more about depression in middle-aged women. Clinical depression is an illness that is far more than the normal and natural states of feeling low that all people will experience at various points in their lives. The condition is characterized by a stubborn feeling of melancholy that does not go away with time, and sometimes does not even seem to have a cause. The negative frame of mind can bring about a sense of mental exhaustion and demotivation that leads to the thought of carrying out even routine tasks seem impossible. Current estimates are that about 1 in 10 American adults suffer from depression. Middle-aged women are a high-risk group for developing clinical depression on two main counts: age and gender. Statistics show that women are almost twice as likely to suffer from depression as men, and this gap widens with age. 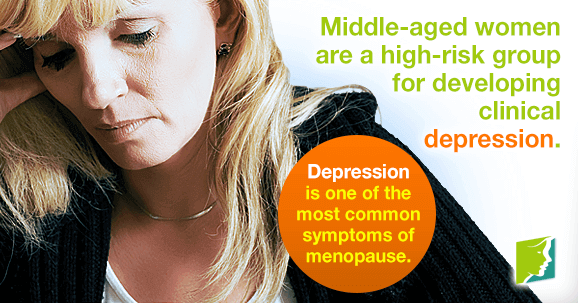 Although it is possible for depression to strike at any age, women are more likely to experience it between the ages of 40 and 59, which typically coincides with menopause. Indeed, depression is one of the most common symptoms of menopause, and this is mostly attributed to hormonal fluctuations. Although other factors also play a role, such as the stress of other menopause symptoms, fears about getting older, or a change in lifestyle. Middle-age is a prime time for depression to take hold, but this does not mean that you should simply put up with it. Depression is treatable, and this is easier in the early stages of the disease. If you fall into the high risk groups and are exhibiting a few of the signs - like changes in appetite, unexplained pains, and loss of libido - it is important to seek medical advice so that you and your doctor can decide on appropriate remedies, medications, and local services to treat the unpleasant and troublesome symptoms of depression. Read more about treatments for menopausal depression.